It’s always a little unsettling when a white Dominican man starts talking like a drug dealer during a Catholic mass. Even if he is a priest. Scratch that—especially if he is a priest. 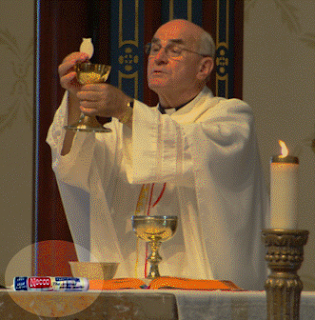 Catholics believe in this thing called the “real presence,” as in when the priest holds up the holy Necco wafer and the bells ring, Catholics believe that it turns into Jesus. Not just symbolically; the belief is that that little cracker is Jesus himself. So what this Bowman guy was talking about was recruiting people to spend some time in the chapel, where a piece of Jesus is kept on display and has to be constantly accompanied by somebody (I guess because Jesus craves companionship like Rush Limbaugh craves attention). I’ve been watching a lot of reruns of “The Wire ” lately, and this phrase “re-up ” is used just about every episode. Typically it’s the at-risk youth peddling heroin on the corners of West Baltimore that are saying it. For example: “Yo, we short, we need a re-up” = “We’re out of our supply of heroin to sell. We need to restock our inventory.” So essentially, this old white priest was comparing Jesus to heroin. But I guess I actually listened to that part, and it even made me think long and hard enough to want to write an entire post about it. So I guess if he was trying to spread awareness, he succeeded. Well done, Fr. Bowman, or whatever the heck your name was.